I think it might be safe to say that I am in love with a piece of technology. And no it's not one of my Apple products;)! 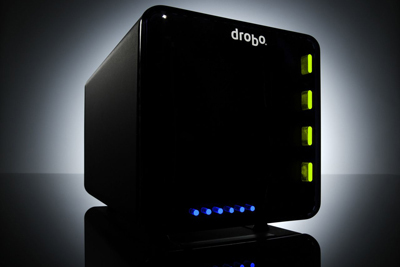 It's my Drobo, the system that I use to backup all of my files. This machine is a beast, copying and transfering thousands upon thousands of RAW files, documents and videos almost daily. It gives me piece of mind and is incredibly safe and reliable. I can't imagine running my business without it! When I first started the business the only backup system I had was my external 1 tb hard drive. It served me well at the beginning but as the business grew so did the amount of files I created. I needed something bigger to store all of my images PLUS something that I knew I could rely on to safely store my images. Enter the Drobo. I wanted the FS to have the capability to work over my network from any point in the house. This means that the Drobo can hook up to my computer without having to be physically connected to the computer. While the transfering of files is a bit slower over the network, I like the flexibility and desk space this allows. I'll end by noting that I don't rely SOLEY on my Drobo. While I probably could, I don't. I have copies of files on my desktop, on the Drobo, on a separate hard drive AND on an online gallery that I can download from. You can never be TOO safe when dealing with client's wedding images! If you don't have a backup system, make the investment today. It is SO worth the piece of mind of knowing that your files are safe, secure and backed up!